After wait seems like a long wait, perhaps because of all the hype and anticipation the company has generated, a small number of Tesla Model S customers have finally received their prize. 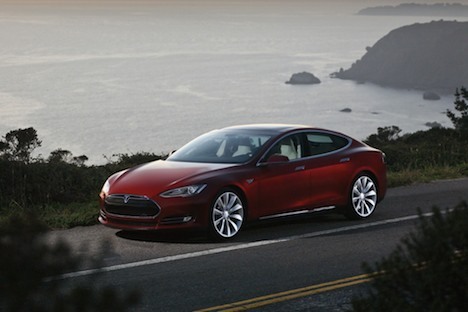 A big media launch was held at the Tesla Motors factory in California to release 10 of the new all-electric sedans. Tesla has said that over 10,000 customers have forked out a refundable deposit for a brand new Model S, and that it is expecting to sell over 5000 this year. The price tag starts at $US49,900 (after tax incentives), and goes a lot higher than that depending on the configuration. These first 10 “Signature” performance sedans are priced from $US97,900. They have an estimated range (at 55 mph) of 300 miles, and can from 0 to 60 mph in 4.4 seconds. Quite a lot is riding on this model S for the NASDAQ-listed Tesla Motors Inc. The company is counting on the success of this model for its first profit. According to CEO Elon Musk, the company could be “cash flow positive” in 2013 with around 8,000 completed sales of the Model S.
Tesla is also aiming to expand in 2014, with projected sales of 35,000 Model S sedans, and the introduction of the Model X all-electric SUV. Following that, all going well, the company plans to aim directly for the mainstream mass-market with a lower-priced all-electric car. Aiming for some serious competition for the hugely popular Toyota Prius line, perhaps? We’ll certainly be watching the progress of the Model S with great interest.